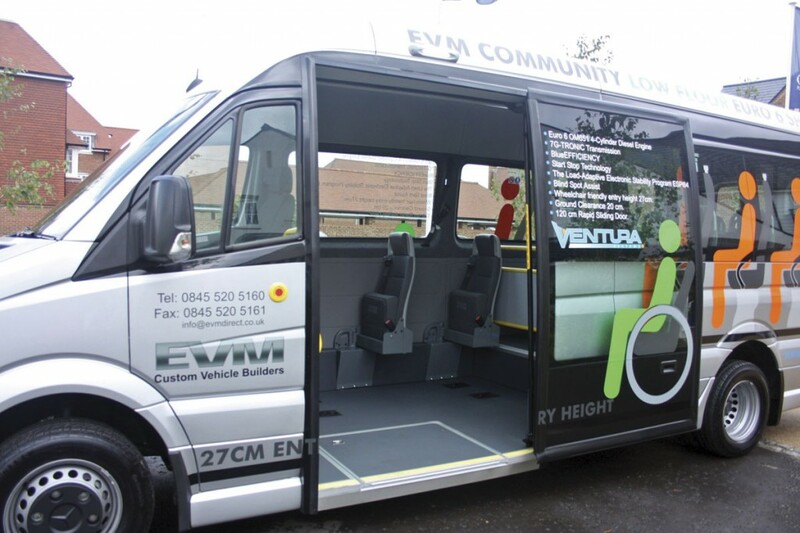 The latest new vehicle added to their range of Mercedes-Benz Sprinter based models by EVM the specialist vehicle converters, is a low floor, directly wheelchair accessible model called the Community. Danny told me they had done a lot of research on the concept before committing to going forward with the project. ‘We didn’t want to just produce a clone of what is already out there, we wanted to try and overcome some of the problems people have operating them, and we think we have done that’, said Danny. The concept isn’t new, indeed Mercedes-Benz itself produces a version which is marketed by EvoBus UK and is called the City 45. VDL also produce a similar vehicle which is marketed in the UK by CVI. However, both of these versions have some significant differences and are considerably more expensive than the new EVM Community. I asked Danny McGee where he saw the main markets for the vehicle. He told me that they did expect to be building some vehicles for the community transport market, judging by the enquiries they had already received since they first floated the idea at last year’s Coach and Bus Live. However, he felt that the larger demand was more likely to come from operators looking for small, directly accessible, shuttle buses. 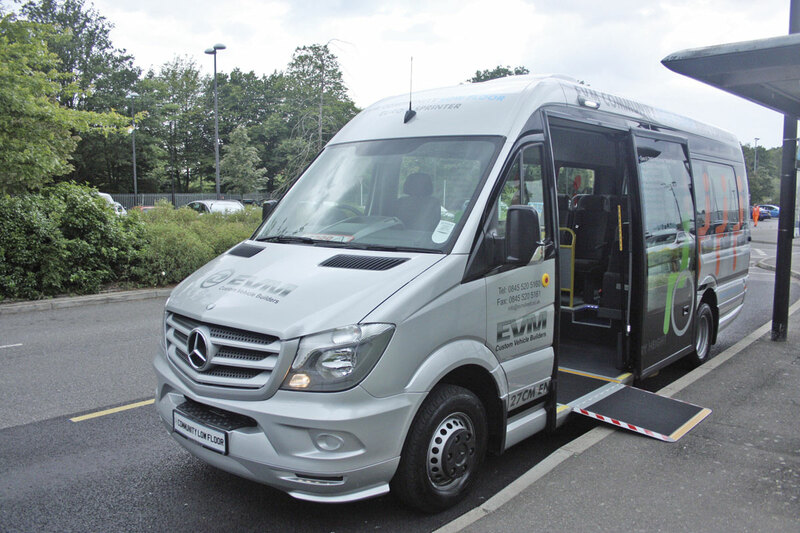 These are typically servicing airport operations, non-peak hour Park and Rides, hospital services and by progressive stage carriage operators who are beginning to realise there are considerable economies to be derived from using vehicles in the quieter times of the day. Economies such as much less fuel usage, much lower initial purchase costs and lower maintenance costs. The basis of the vehicle is a standard Mercedes-Benz long wheelbase van. 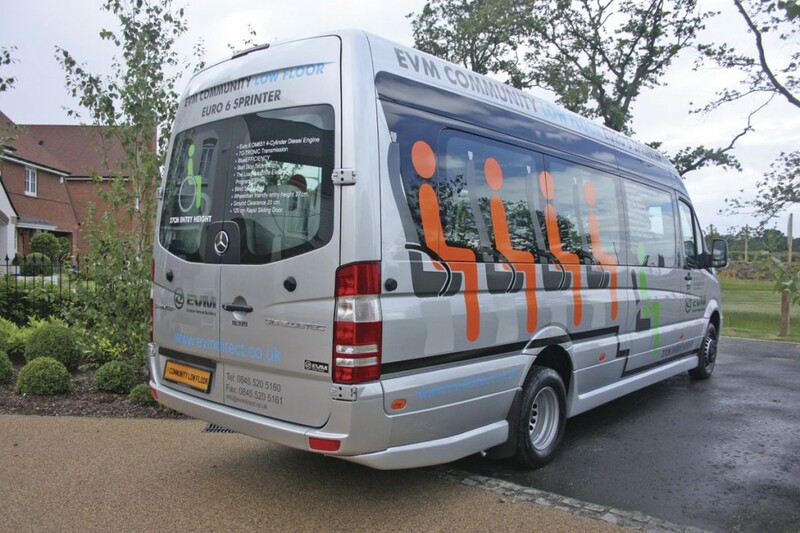 EVM’s standard vehicle is the 516 Euro6 unit although they do use other Sprinter models, notably the 519. The chassis and floor is cut just behind the cab and just ahead of the rear axle and removed. In its place a sunken floor pan, supplied by Mercedes-Benz, is inserted to provide the low floor, direct wheelchair accessibility features. It enables the vehicle to achieve a ground to entrance floor height of just 27cm whilst the ground clearance in the lowered section is maintained at 20cm. The drive from the transmission to the rear axle is achieved using an integrally mounted drop box on the back of the transmission. This enables a flat prop shaft to be fitted. The problem with many similar conversions is that the prop shaft passes beneath the lowered floor. This presents problems for operators because it does make them very vulnerable to damage, especially when operating in locations with traffic calming, which is typical of the areas they are operated. EVM have solved this problem by routing the prop shaft through the honeycomb floor. The exhaust is a special one developed by Mercedes-Benz for low floor vehicles. It is angled behind the B-pillar so that the catalyst is positioned transversally in the vehicle. It therefore only fits chassis or panel van conversions equipped with Z-reversing gear, as is the norm for low-floor conversions. The conversion uses a very high level of standard Mercedes-Benz supplied componentry and little unique equipment. 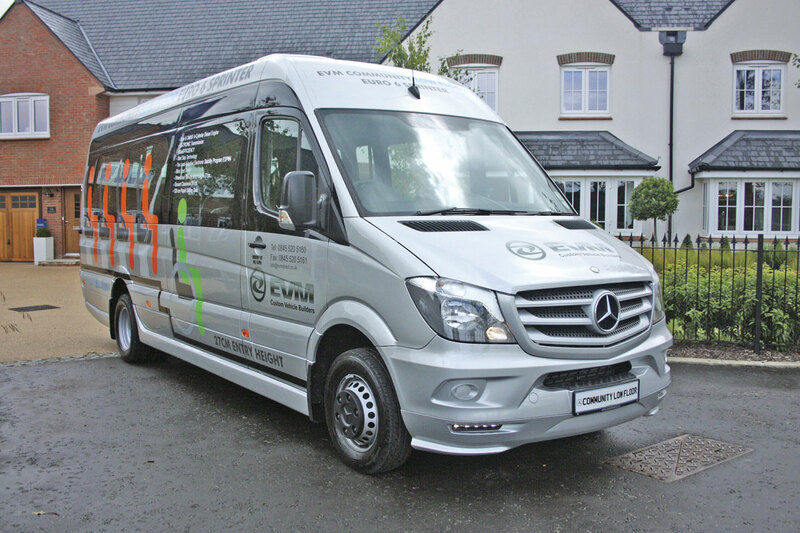 The conversion is fully Mercedes-Benz approved and has been extensively tested which is why it has taken some time for EVM to be able to bring it to the market. In developing the prototype EVM engineers decided to go for the most difficult option, with a forward facing wheelchair location first, although recognising that there are likely to be few ordered. ‘Some people might think it was a strange decision,’ said Danny McGee, ‘but we were starting with a clean sheet of paper and felt by tackling the most difficult option first we would have all bases covered and not have to do hasty re-designing work when somebody decided that was the option they wanted.’ The main complication of locating the wheelchair in a forward facing position is that the wheelchair has to be secured to the floor using some form of clamping system. In the case of the prototype these are Flexi Trans units which are sunken into the floor to leave a flush surface. They can however, also fit any of the more usual systems such as those produced by Unwin, Koller and Q’Straint. A major difference between EVM’s Community and other similar vehicles on the market is the doorway and door system. Danny again, ‘We talked to a lot of people who use these types of vehicles and found a general feeling that doorways are too narrow and they did not like twin doors that open outwards. 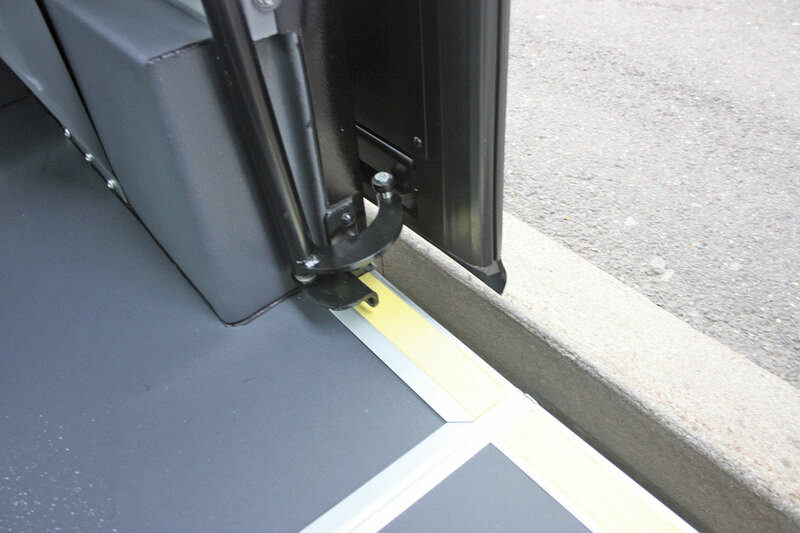 They told us that these often get damaged because they hit street furniture at stops, so we sought to avoid that problem.’ They found the solution in a standard door developed by Ventura primarily for the British bus industry and widely in service. The door is a 120cm wide, thin, sliding unit, which opens rearwards. When open it projects only 9.5cm from the body side. Other virtues of the door are that it is quick acting, silent in operation and shuts and locks positively to leave a flush body side. It also has the great advantage that all the operating mechanism is housed within the vehicle, over the door. None of it is on the outside beneath the floor. Ventura is a new supplier for EVM, they normally use Masats doors on their vehicles, but Danny told me they were very impressed with interest shown by the company in the project, the quality of the equipment and how easy it was to install and set up. He has equally been impressed with its performance so far. Another factor in the decision was the excellent nationwide service back-up Ventura provides through UK agents and PSV Glass. Looking at the vehicle in more detail, it is a standard Sprinter 516 long wheelbase van with a wheelbase of 4325mm, a front overhang of 1004mm and a rear overhang of 2016mm giving an overall length of 7.345m. The overall width is 2.0m and the overall height 2.8m. It is rear wheel driven and has twin wheels at the rear. The engine is the very latest version of the Mercedes-Benz OM651 unit to Euro6 emissions standard. These are markedly stricter emission limits than that of Euro5. Nitrogen oxides (NOx) have had to be lowered by 80% to a mere 0.4 g/kWh. Whilst permissible level for hydrocarbons (THC) is cut by 70% to 0.13 g/kWh and the limit for particulate matter is reduced by 50%. In order to achieve Euro6 Mercedes-Benz has had to introduce the use of AdBlue additive into the exhaust system on the Sprinter engine and this may be new to some operators in this sector. The Sprinter now sports an 18-litre AdBlue tank on the inside of the bonnet. Mercedes-Benz claims that this is sufficient for around 6000 km operation. The engineers used the developments for Euro6 to optimise the injection characteristics, the combustion process and the charge pressure of the engine, all of which they claim will result in lower fuel consumption, quieter combustion and smoother running. 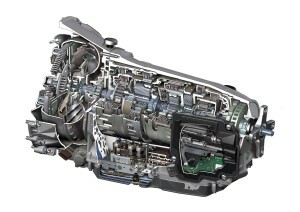 The engine in the Sprinter 516 as used by EVM is the 2.2 litre OM 651 four-cylinder diesel. Unusually this engine has an under square configuration with cylinder bores of 83mm and a stroke of 99mm which Mercedes-Benz claim is why the engine has such high tractive power. The two overhead camshafts actuate a total of 16 intake and exhaust valves and the camshafts are driven by a combination of gearwheels and a short chain. The common rail injection system operates at a maximum injection pressure of 1800 bar with the fuel injected by means of magnetic injectors and seven-hole injection nozzles. Charging is via a two-stage exhaust-gas turbocharger system. This system ensures that the maximum torque is available from low engine speeds and across a broad engine speed range enabling the engine to attain both a high specific power output and high torque. These are crucial factors in lowering fuel consumption, achieving the low emissions and optimising weight. The engine’s extremely smooth running characteristics are helped by a Lanchester balancer with two counter-rotating shafts, having the camshaft drive positioned further to the rear and by the use of a two-mass flywheel. The exhaust gas recirculation with two-stage cooling and the SCR technology with AdBlue injection and a particulate filter ensure achievement of the Euro6 exhaust emissions consistently. The engine is rated at 163bhp (120kW) at 3800 rpm and with max torque of 360Nm between 1400 and 2400rpm. In the EVM Community, the engine is matched to the new Mercedes-Benz seven speed 7G Tronic Plus fully automatic transmission. The 7G Tronic Plus has won accolades for its smooth, quiet, efficient operation and quite rightly because it is an absolutely wonderful transmission to use giving luxury car credentials to a commercial vehicle. It is possible to change the transmission manually by pushing the lever to the right to go up the gears or left to go down them. There is no clutch involved. Whilst this does enable you to hold a particular gear, unlike the common misconception that a manual change will give better fuel economy, in the 7G Tronic Plus it does not. The front suspension is the familiar MB fully independent system with powered rack and pinion steering whilst the rear uses the conventional long leaf spring system supporting the hypoid bevel driven rear axle and with telescopic dampers and anti-roll bar. Although not necessary on this vehicle because of its low entrance step level, air suspension is an option. Because of the lowered front section the fuel tank is re-positioned at the rear on the nearside. Apart from the entrance door arrangement, which I have already mentioned, the remainder of the vehicle is standard Sprinter. The particular vehicle I tested, the prototype, was originally built for exhibition at Coach and Bus Live and because of that has a few EVM extras on it like styling skirts etc. that would not be on as standard vehicles unless operators specified them. The twin rear doors are retained although it would be possible to replace this with a coach type back end at extra cost. Peter Flynn, Danny’s right hand man, explained to me that they would not be looking to develop a whole raft of alternatives. ‘The concept is a value for money, low floor option for those operators that want it and which is backed proven reliability and EVM quality build. Changes to the basic specification which can be accommodated within the existing design we will look at, but we don’t want to get caught up putting a lot of design effort into developing variants we only ever sell one or two of.’ said Peter. 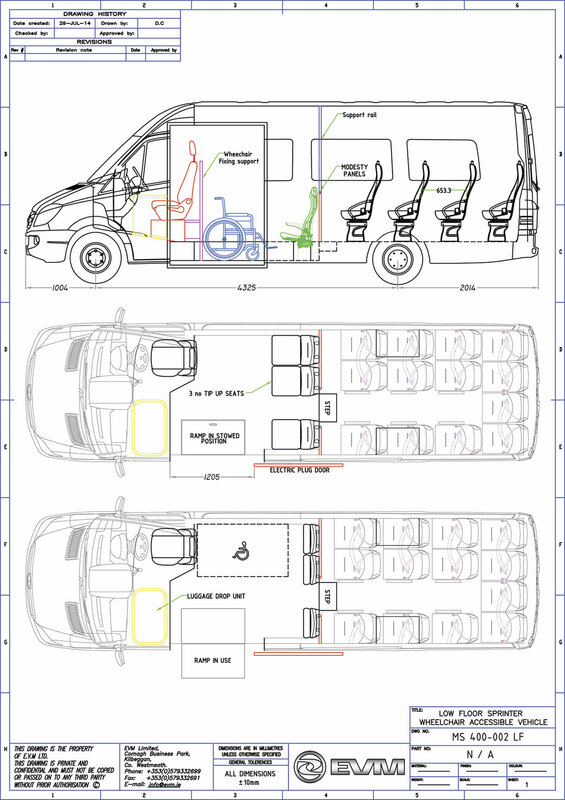 Some operators require not only a directly wheelchair accessible side entrance but also the facility to load additional wheelchairs in through the rear doors using a tail-lift. EVM cater for this by engineering the Community to accept either a fold out rear ramp or in-board lift. In these circumstances the fitting of optional lowering rear air suspension is recommended. 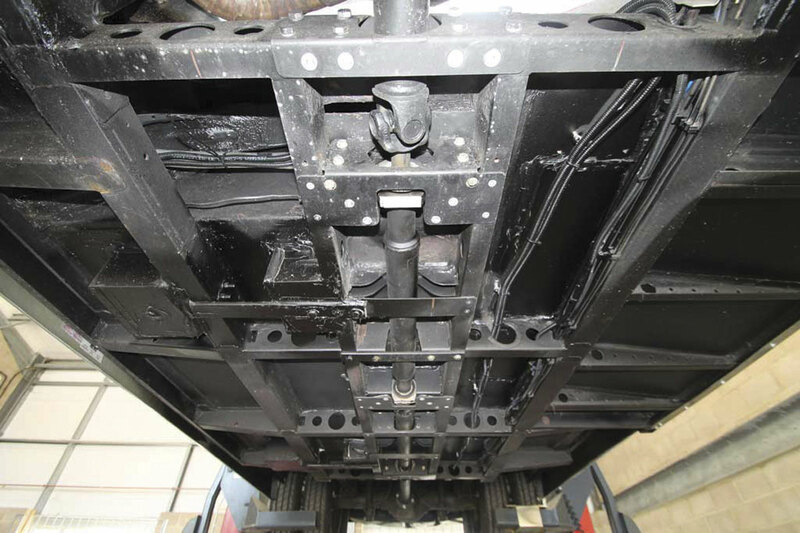 A rear underfloor cassette type tail lift cannot be fitted because of the fuel tank location. 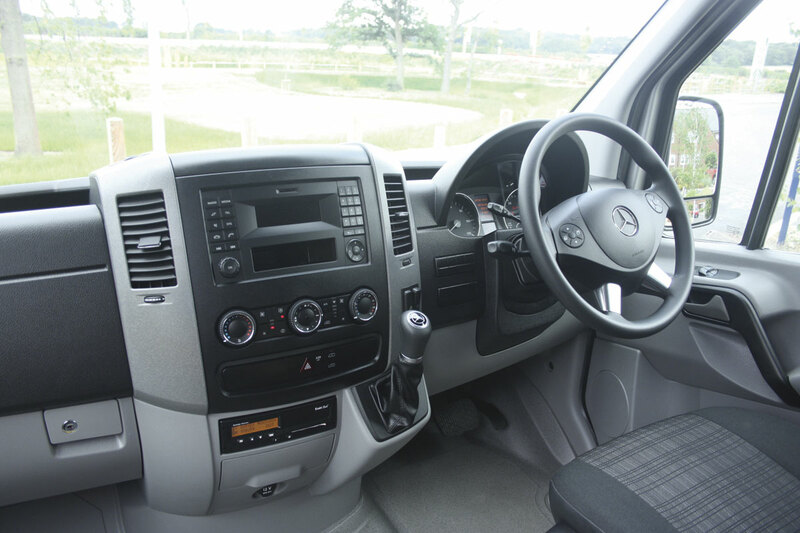 The cab of the EVM Community is standard Mercedes-Benz Sprinter and why not, it is an excellent cab with a supremely comfortable, adjustable, belted seat, fully adjustable steering wheel, well placed controls and switches and excellent vision coupled with exceptional external mirrors. The nearside door is sealed and the space normally taken up by the front passenger seat is allocated for a luggage pen. 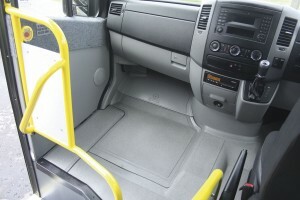 There is access to the cab from inside the vehicle via a single step although most drivers will probably prefer to use the normal offside external cab entrance door. 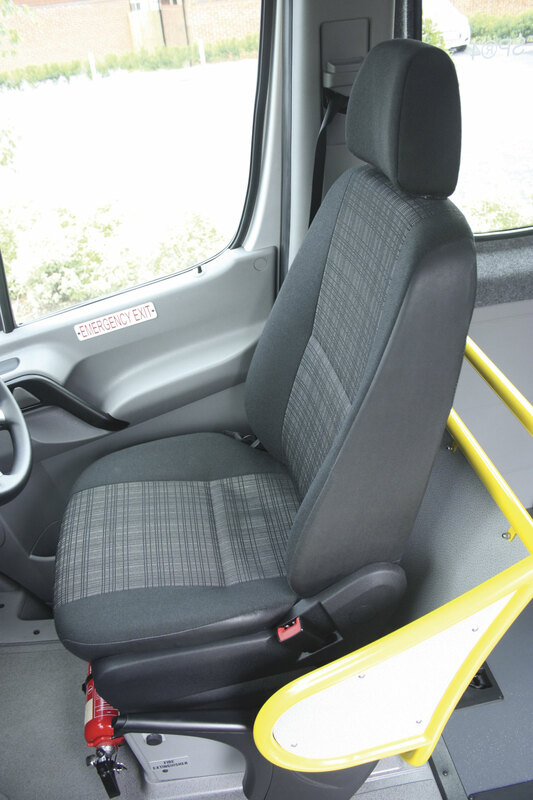 This particular vehicle was fitted seats with Politecnica Arco seating which would probably not be the first choice by many, for this type of vehicle. 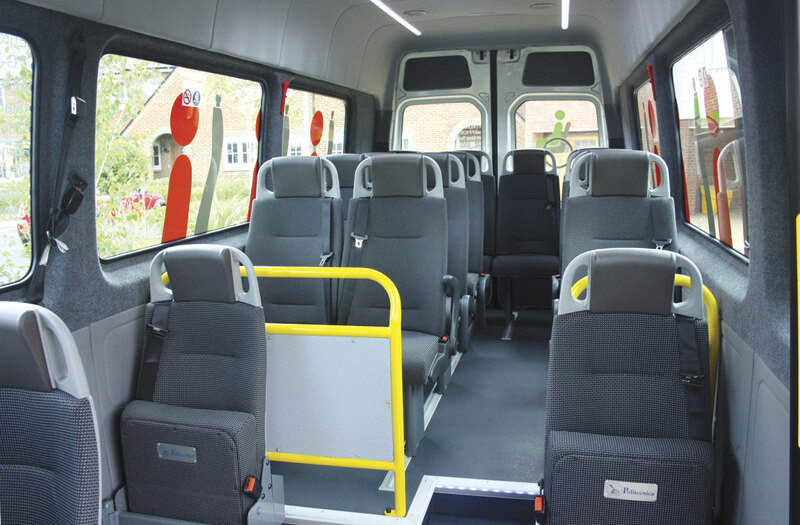 It has already being engineered to take the more familiar seating styles such as Rescroft’s CT Lite and CT Lite Space and the Phoenix Blenheim and Hydra. The rear section can be fitted with tracking if required and seats mounted on removable fittings. The same treatment can be applied to the lowered floor section if requested. Glazing is bonded, tinted single units with doubles as an option. Two of them are equipped with hammers to enable their use as emergency exits as is the glazed roof hatch. This particular vehicle did not have parcel shelves but these are available as an option, as are individual passenger controls, lighting, speakers and other features. In this particular vehicle there were full length lighting units mounted in the ceiling, with a night driving setting. 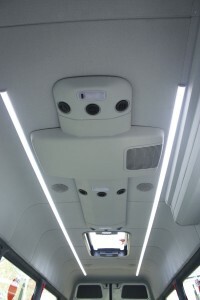 Also located in the ceiling are the speakers for the vehicles on-board sound system. The vehicle is equipped with Mercedes-Benz air conditioning distributed from the ceiling mounted unit and with separate systems for the saloon and the driver. Heating is via a Webasto powered underfloor system. There are a wide range of standard Mercedes-Benz extra equipment items that can be fitted including front and rear sensors, reversing camera, more advanced sound and vision systems, telecommunications systems and CCTV. 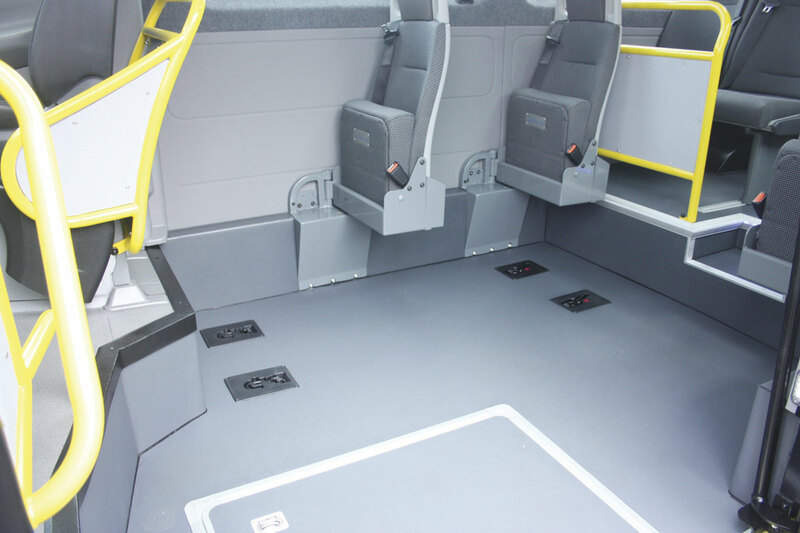 One must also mention the host of safety features that are fitted on the new Euro6 Sprinter. At times the list seems to grow faster than you can absorb it and it is confusing because some are standard and some are not. The most important safety feature is the Adaptive ESP. This embraces the anti-lock brake system (ABS), acceleration slip regulation (ASR), electronic brake distribution (EBD), hydraulic brake assistance (BAS), roll-over mitigation, roll-over protection and roll movement intervention (ROM/RMI), enhanced understeering control (EUC), automatic brake disc drying system, sometimes called brake disc wiping, when driving in rain and anticipatory preparation of the brake pads in critical driving situations sometimes called electronic brake refill. The latest standard addition is Blind Spot Assist; I’ll talk more about that later. Available as options under the Driving Assistance Package are Collision Prevention Assist, High Beam Assist and Lane Guard. Not currently available either as standard or as an option, but I expect it to be added very soon is Crosswind Assist. This is already a standard feature on Sprinter vans up to 3.5 tonnes GVW. Some of these additional safety features are not available on the Sprinter chassis cab so may not be on coachbuilt minibuses. Always keen to get behind the wheel I jumped at the chance to take the new Community on the road. I don’t really know what I was expecting; I’ve driven new Euro6 Sprinters before and with the 7G Tronic Plus transmission, so it presented no surprises. The Community was just as sweet running as the others I had driven. Smooth, powerful and quiet. The gear change is an absolute delight. Most of the time, as I have commented before, you are unaware of the changes at all. I did wonder whether the lowered floor plan would affect the handling but it doesn’t and it lived up to EVM’s claims when I put it to some speed humps, clearing them without any hint of scraping anything on the ground – a big bonus that. I tried out the wheelchair access facility, although without a wheelchair. I was very impressed with the smooth operation of the door and the wide entrance revealed. The ramp was easy to fold out and against a pavement provided a near flat entrance which would be easily negotiated by a wheelchair whether hand operated or motorised. The ramp folded back completely flush. The clear floor area with the seats folded out of the way left plenty of room for a wheelchair to manoeuvre. Ride on the vehicle was just the same as on a conventional higher floored Sprinter as was vision from the large windows. The ambience from the Mercedes-Benz air conditioning was well maintained, even when opening the large entrance door. As I have come to expect from EVM’s conversions it didn’t squeak and it didn’t rattle. Driving it as I have found with all Sprinters in the last few years was an absolute pleasure. Is the Euro6 any better than the Euro5? I think so, it feels a bit torquier and it is definitely quieter and smoother – and I thought Euro5s were good! This particular vehicle had the Blind Spot Assist, another new safety feature, which I have not experienced before, but I was impressed with it. If you get an object, for example a cyclist or errant pedestrian on your nearside, it flashes a yellow triangle on the dash and bleeps, if you then put on your left turn indicator the triangle turns red and the bleeping gets louder and more urgent – you can’t ignore it. It operates using a special second section on the nearside mirror. The system uses four close-range radar sensors to monitor the vehicle ‘blind spot’ in the areas directly alongside and up to 3m behind the car. It is activated via the instrument cluster and is operational from speeds of 18 mph. I’m not always a lover of all these new gismos fearing we will breed a race of drivers who become thoroughly reliant on them, but this is one that I think is excellent. Warranty on the vehicle is three years unlimited on the Mercedes-Benz aspects including the drop box and air conditioning and two years on the EVM aspects with the option of extending that to a third year. I think EVM have carried out a really thorough job on the new Community. It is well thought out, well-engineered and well built. They have addressed some of the drawbacks of other vehicles in this class well. EVM are quoting a price of around £70,000 plus VAT for a 16-seat version with conventional rear facing wheelchair bay but otherwise more or less as I tested, and at that price I think they will find potential customers are very interested. Definitely a good addition to their range of conversions. This is the Mercedes Benz OEM Saloon Air Conditioning unit.